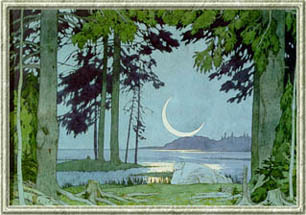 9 Comments on "The Art of Ivan Bilibin"
Thank you! This is a lovely, concise, and illuminating summary of Bilibin’s career. I will be referring my students to it in the fall. I have a wooden rectangular box with an indented design on the hinged lid of a girl in a forest looking down at toadstools. 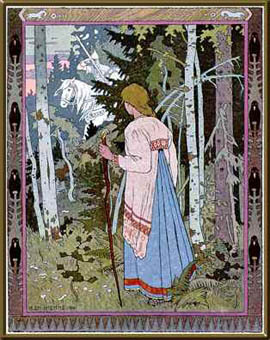 She is wearing colourful Russian style clothes and looks very much like a Bilibin design. Could this be possible please? Ivan Bilibins son Ivan Bilibin was my husbands uncle. We would like to see some of his work. Do you know where we may see some. We both remember seeing a couple of originals in their house and they were really beautiful. Hi, I am an art historian researching the British reception of Russian arts and crafts. Thank you for a fascinating post. I am intrigued by the Jenner’s notice that you mention and wondered if you might be able to put me in touch with the collector. I’ve not found references to B being sold in Scotland before. 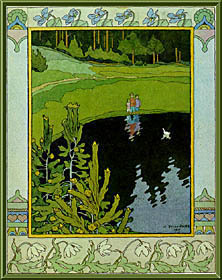 Loved finding this website and learning about Ivan Bilibin. 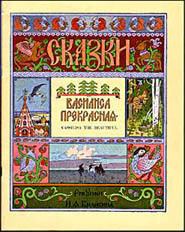 I believe I have first editions of two books illustrated by Bilibin, dating from 1902 and 1905. Does anyone know what these would be worth? Thanks for your help. I felt had lost their vibrancy and magic. There are vast differences in the quality of the reproductions, I have found. Almost like the Sistine chapel! Some of the prints of his work are vibrant and colorful, while other renditions of the same illustration are dull and lifeless. I enjoyed your article very much. I am always on the lookout for more information about Bilibin. Having learned about the suffering of the people during the siege of Leningrad, I would like to know more about his last days. I wonder how he spent his time as he starved to death. Did he create any art during that period? It is so poignant to me that someone who created such a magical fantasy world would die in such dire circumstances. I wonder if there is an account of that anywhere. I am limited by my very basic Russian skills. Thank you again for the article!